Oliver Traphagen designed the six townhouses that made up Pastoret Terrace in the Romanesque Revival style of architecture, which would essentially become his “trademark look” for buildings in Duluth. Built by Michael Pastoret, the two-and-a-half story brick building featured brownstone-trimmed windows, wrought iron details on the roof, small entry porches, and a round corner tower with a tall finial. When construction finished, Pastoret advertised his new townhouse as “costly” to appeal to wealthy professionals, the very type of folks looking for upscale downtown living in a city that was once again experiencing boom times. By 1924 downtown living had lost its appeal to the wealthy and most of the building’s luxury units became rental apartments. That same year new owners extended the first floor on both East First Street and Second Avenue, added a restaurant, and removed the tower roof. After Prohibition the restaurant became a tavern and the six townhouses were divided into many apartments — forty by 1961, fifty by 2009. In about 1960 the tavern became the Kozy Bar. When Duluth’s Bowery was destroyed for the Gateway Renewal Project, many of its socially marginalized inhabitants found other places to live — and drink. With extremely low rents and the Kozy Bar right downstairs (and other low-rent taverns nearby) Pastoret Flats became a magnet for many former Bowery residents. Soon the entire building was known simply — and notoriously — as The Kozy. For many years an overwhelming number of Duluth’s police calls were made in response to incidents at the Kozy or just outside its doors. The building’s most recent owner, Dr. Eric Ringsred, was trying to make it a positive gathering space for his tenants and bar patrons, many of whom suffered from alcoholism, drug abuse, and mental illness and all of whom had little or no income. That plan went up in flames on November 15, 2010, when a fire started in Unit 32. According to Ringsred, “There was a lot of mischief in that room with drugs.” The flames spread quickly, but tenants made sure no one became trapped inside; firefighters also escorted a few tenants out and saved a cat and a dog. 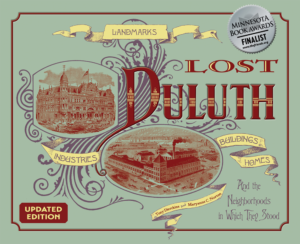 Everyone survived but all lost their homes, the only housing in Duluth they could afford. Rent at the Kozy ranged from $160 to $460 a month. Unfortunately, Dr. Rinsgred only had liability insurance for the building. As of this writing, Pastoret Flats still stands, but the building is a burned-out ruin and restoration seems unlikely for both structural safety and financial reasons. As of March 2017 the city of Duluth was seeking proposals from developers for the future of the building.